1. 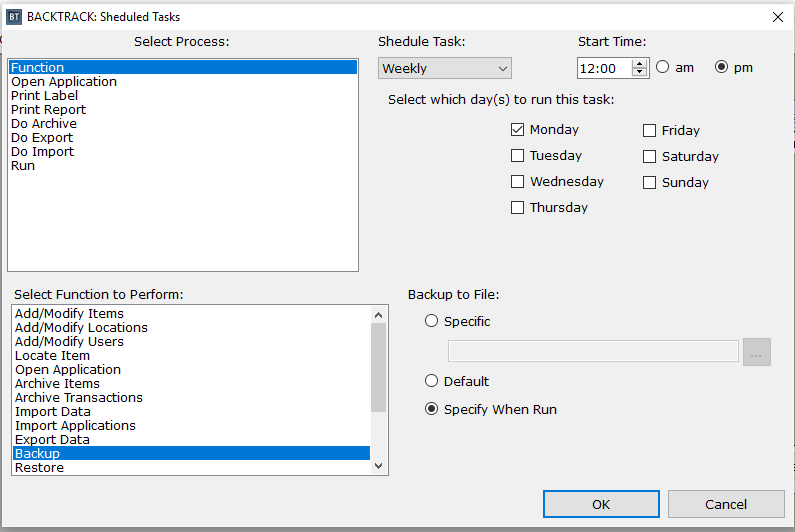 In BACKTRACK 2012, navigate to ‘Task Scheduler’: Main menu > Database maintenance > Administration functions > Task scheduler. 2. Select ‘Add’ to create a new task. The ‘Specific’ function: Since this function can be uniquely named, it means that the software will overwrite the backup’s file name, with the same characters that was specified during input. The ‘Specify when run’ function: This function will prompt the user to manually input the name and location where the backup will be stored. The prompt will remain open until a user fills in the information and starts the backup. Note: In order for the task schedule to function, BACKTRAK has to be running.